Flashlights – The kind of flashlight you use for this activity is important. LED flashlights are preferred, but whatever kind you use, it is best if you can remove the reflector from the head of the flashlight. 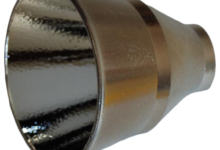 The reflector is the shiny, silver cone that lies just inside the lens, and the bulb of the flashlight typically shines inside it. See Figure 1 in Resources below for an idea of what it looks like. 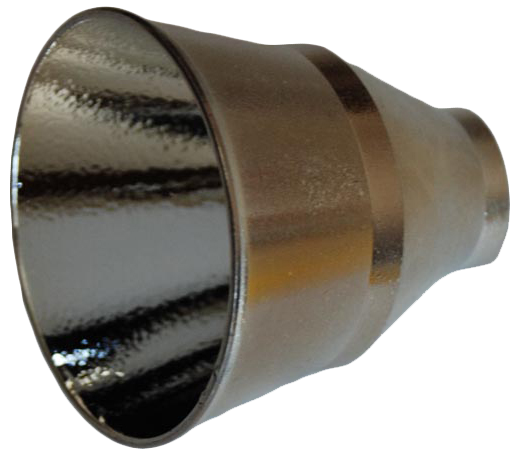 The reflector helps to concentrate the light from the bulb into a defined beam. But for the purposes of this activity, the reflector will result in fuzzy parts of the constellation, or haloes around the stars you are trying to project. Some LED flashlights make it impossible for you to remove the reflector, so see “Suggestions” for flashlight models that work well. Non-LED flashlights with removable bulbs almost always work, and are less expensive than LED lights, but are not as bright as LEDs. You can run this activity with only one flashlight if necessary, or you can have children share as many flashlights as you have available. Cups – the paper cups should fit over the lit end of your flashlights, and the flashlight should fit at least part of the way into the cup. It might be a good idea to have a few different sizes of cup available for testing. 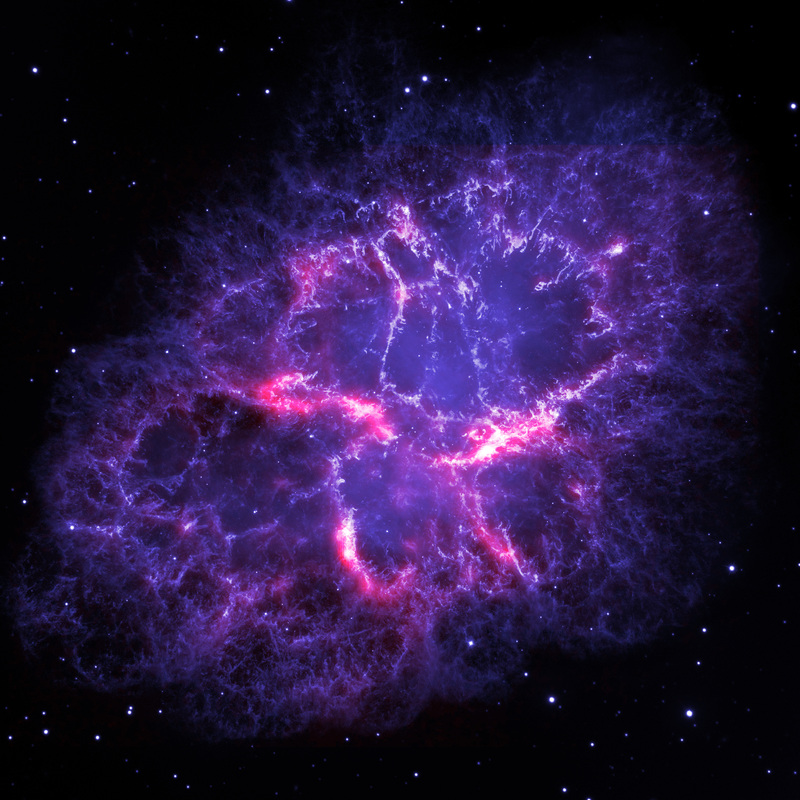 If you have not yet done it, you might try the Constellation Creation activity from this curriculum as a precursor to this one (click here). If you did this activity, ask your students about the constellations they created. If you did not try Constellation Creation, start by asking your students if they have heard of constellations before. What are constellations? Where can we see them? Where did their names come from? Show your students the images of constellations that you printed, or show them these constellations on a computer, or you can even find your own images to show them online. See “Suggestions” for links to these images. Do they recognize any of these constellations? Create your own constellation projections using the materials you are given. You can have your children work individually or in teams. Distribute materials to the children or teams. Ask your students to look at the constellations you printed or have on a computer screen, and ask them to choose one that they like. Tell them that you would like them to create a constellation projector using the cups, tacks and flashlights. This activity works best in a darkened room, though not so dark that children are bumping in to each other. Darken any windows you can, at the very least, and get the room as dim as you are able. Show your students how the cups fit over the flashlights, and turn the flashlight on with a cup on it. What do they notice? They should see the inside of the cup, and the bottom of the cup lit up. Show them that when you poke a few holes in the bottom of a cup, then slide it on the lit-up end of the flashlight and point it at a wall, they will see a projection of the holes you made as points of light on the wall. Ask them how they might project a large image of a constellation using these cups. 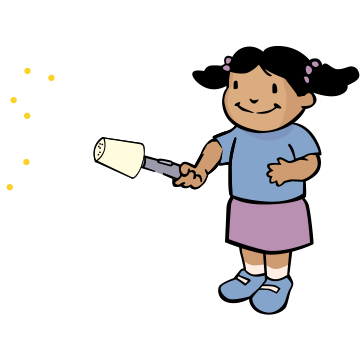 Hand out the materials and encourage children to choose a constellation and create a constellation projector using those materials. After children have created a constellation or two, bring the group together to talk about what they did. Did anyone notice anything about the projected constellations? If they don’t mention it, point out that if they poked the holes going in from the bottom of the cups, so that the constellation looks correct on the bottom of the cup, then it will look backwards when projected. How could they fix this? Also, ask them what they noticed about how the constellations looked when they moved the flashlight farther in or out of the cup. Are there any other changes they would like to make to their cups? Some children have used black construction paper circles on the bottoms of the cups, before poking the holes. Some children have trimmed long cups so that they were shorter and easier to handle. Some children have even decorated the outsides of their cups with themes that match their chosen constellations. Divide the group into two, three or four teams. Each team should take turns shining one of their constellation cups on a chosen wall, but without revealing what constellation it is. Make sure they are projecting it in the proper orientation that they might see it in the sky (it should match the images you printed out or showed them on screen). The other teams will write down what constellation they think they are seeing, and share their guesses after every team has written down a guess. The team that projected the constellation should reveal the correct name of the constellation. Play several rounds, keeping score as you go. Have teams make more cups, and play again! Mag Lites are the best flashlights for this activity, as they are LED, bright, and have removable reflectors. The Mag Lite Mini LED 2-Cell AAA Flashlight is around $15, and the AA model is around $20. You can find Mag Lites at Amazon (click here), Home Depot, Lowe’s, etc. You can try this activity with less expensive, incandescent bulb flashlights – just be certain the reflector is removable, and that your room is nice and dark to accommodate the dimmer lights. That last link is a printable image that would work great for this activity, though they do not represent precisely accurate distances between the stars in each constellation. 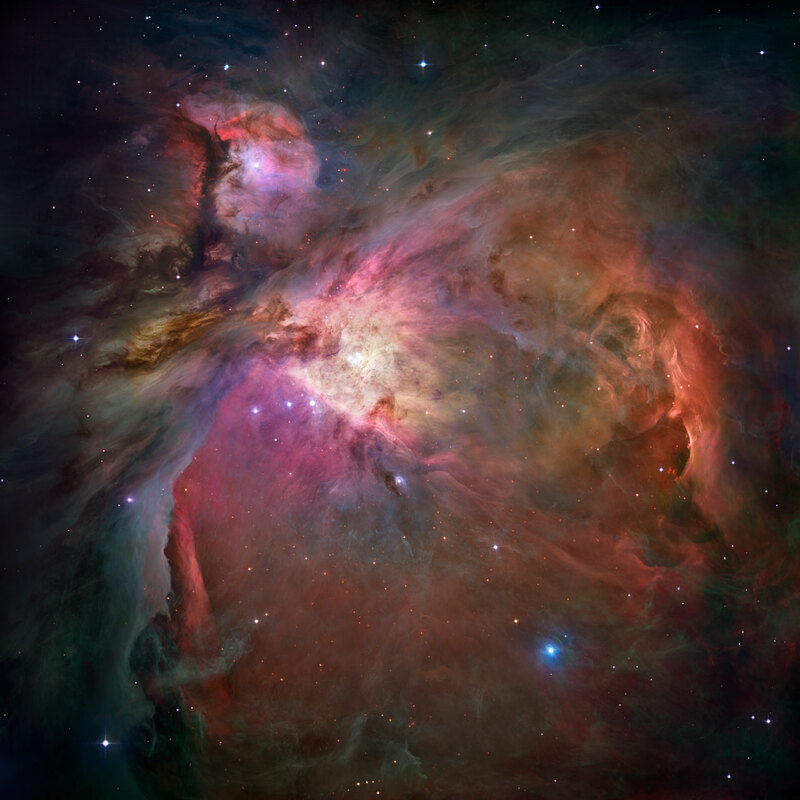 The Orion Nebula (click here for Hubble image) is in the belt of the Orion Constellation. 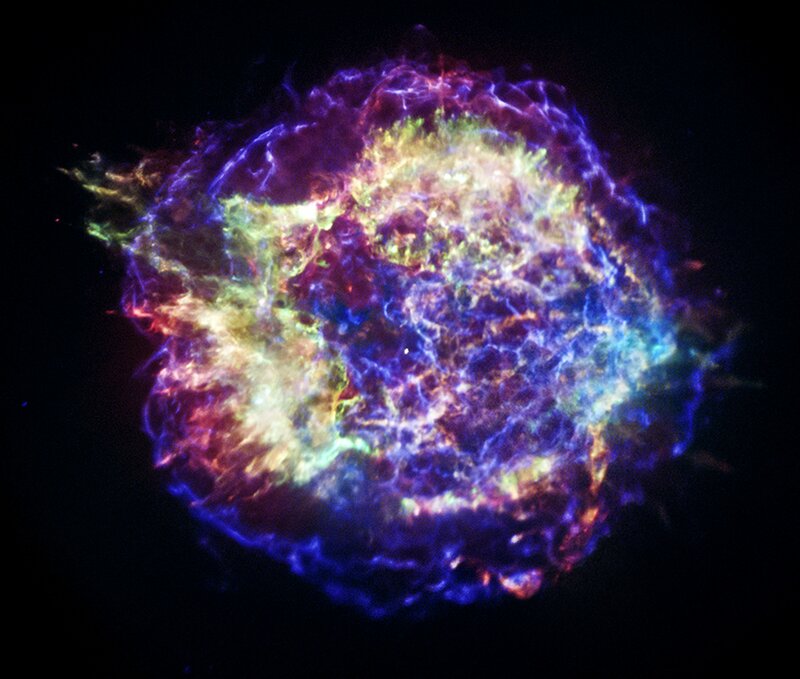 The constellations Cassiopeia and Taurus hosts several supernova remnants (exploded star guts) – Chandra has images of Cassiopeia A and Tycho’s Supernova in Cassiopeia, and the Crab Nebula (Hubble and Chandra) is located in the sky in the Taurus constellation. The Big Dipper (Ursa Major) is LOADED with galaxies that astronomers like to investigate: The “Whirlpool” (M51), “Pinwheel” (M101), and “Cigar” (M82) galaxies are all in that direction. OPTIONAL (for your oldest students): You can ask your students how they made sure to be as accurate as possible when they made their constellation cups. How could they be more accurate? Suggest they measure the distances between stars in the NASA images, and figure out how to match those relative distances on their cups. This is a good math activity about scale – the ratio of a distance between two objects on a map (or, in this case, the constellation cups) to the relative distance between the objects in reality (in this case, up in the sky, or in the NASA images). Here is one way to determine the best measurements for your constellation cups: Divide the measurement the constellation will be on the cup, by the measurement of the constellation’s longest side on the printed image. For example, if the longest side of the constellation on the bottom of the cup is one inch, and the longest side of the printed constellation is 6.5 inches: 1÷6.5 = 0.154.